Fish lovers will be happy to know that Plaza Brasserie at Parkroyal on Beach Road has a fish buffet promotion: Best of Asia Buffet with the Freshest Catch from July 5 to Aug 31. The buffet is available from Mondays to Fridays for $45++/head, and it offers an amazing variety of fish on top of their usual buffet spread. Freshest catch of the day: Promfret, Sea Bass, Baby Snapper, Sea Bream, Kee Fish, Milk Fish, Red and Black Tilapia Fishes, Song Fish, and Norwegian Salmon Fish Head. Preparation styles: Hong Kong Cantonese, Teochew, Nyonya, Thai Lime & Chilli, Sweet & Sour, Black Bean, Indian or local curry. It is important to note that Plaza Brasserie serves an entire fish for each order. Just to clarify further, the fish is not from the buffet counter, it will be served directly to your table. 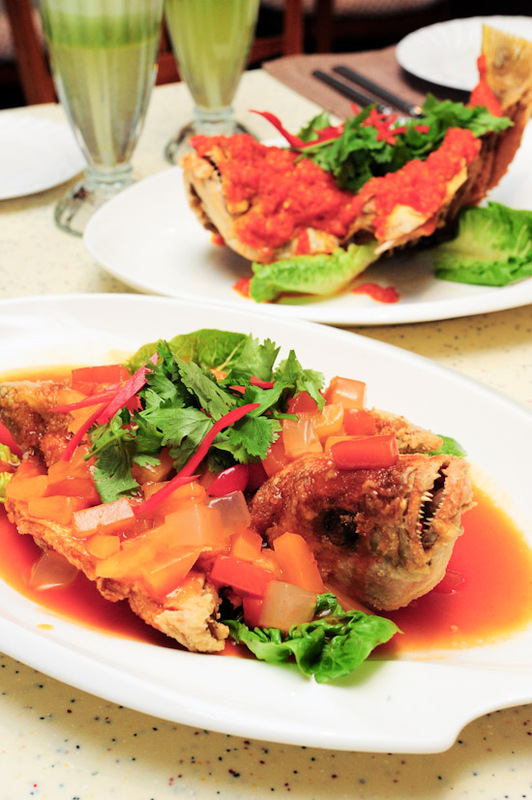 That means to say, if you order three different types of fish: Curry Fish Head, Steamed Teochew Promfret, and Deep-Fried Sweet & Sour Kee Fish; you will be getting one (huge) fish head, and two whole fish. It is impossible to try the different types of fish and preparation styles if there is only two people. Unlike other buffets, it is necessary for you to gather more than four to fully enjoy the fish buffet, unless you have the appetite to eat a few whole fishes by your own. The four of us shared five different types of fish. The Deep Fried Sweet & Sour Kee Fish was my favourite among them. I am a scaredy cat when it comes to spicy food, so both the Deep Fried Nyonya Chilli Kee Fish and the Malay Curry Fish Head were too hot for me. The Indian Curry Fish Head wasn’t too spicy and the gravy was perfect to go along with white rice. And oh, did I tell you about the Steamed Sea Bass in Hong Kong Cantonese style? It was excellent. Beyond that, the buffet comes with a salad counter, an ala minute ‘live’ cooking station, main course section, and desserts. Some of the hot varieties include Deep-Fried Prawns with Almonds, Stir-Fried Beef with Ginger and Spring Onion, and their signature crispy soft shell crabs & Braised Sea Cucumber with Roast Pork. At the ‘live’ cooking station, there’s laksa, roti prata, chilli crab with mantou, tempura, and an assortment of sushi and sashimi to choose from. The tempura was really good – one of the best I’ve had. The sashimi, on the other hand, wasn’t that fresh. We ended our meal on a sweet note with desserts. Plaza Brasserie has a fantastic Chocolate Truffle cake. On its own, Plaza Brasserie’s buffet is decent for its price, but not what I would call a must-try buffet. It is a different story for the ‘Best of Asia Buffet with The Freshest Catch‘. The 2 month special feature provides enough oomph to elevate the buffet to something better, making it an extremely value for money buffet (especially for fish-lovers). The Freshest Catch Buffet (Adult $45++, Child $27++) is available at Plaza Brasserie from July 5 to Aug 31 on weekdays dinner. Note: This was an invited media dinner.